It is important that you lift the whip completely up and out of the socket before folding the hinge. Like any hinge, it will BREAK if it is folded the wrong direction. The hinge rotates 360 deg inside the socket so it will fold in the direction needed. 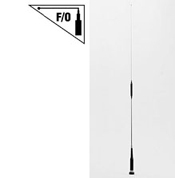 Many Chinese copies and other look-a-like antennas have very annoying problems associated with their fold-over hinges. The most common is a weak spring. The antenna will lift up and out of the socket all by itself at highway speeds! The antenna is unusable when it is laying down and most users need to defeat the hinge or constantly adjust the angle to keep it vertical. To be honest, Comet had this problem “initially” as well! The weak fold-over spring was almost always a problem with the larger antennas. Comet engineers went to work and re-designed the fold-over. Our larger antennas now have a threaded collar around the hinge: Loosen the collar, lift it up, and the hinge is exposed. No more problem of the antenna spring expanding and the antenna laying down by itself at highway speed! **Warning** Some antenna companies have copied the Comet fold-over design and improved their fold-over feature, but many have chosen NOT to make the improvement and save the cost. Keep in mind the SBB-15 is a 1/4 wave on the 6M band. A 1/4 wave is only half an antenna, the other half is the ground plane underneath it. Installing a 1/4 wave on 10 different vehicles will create 10 different SWR results. The SWR on a single band antenna can be adjusted by adjusting the length of the antenna to compensate for the difference in impedance provided at each mounting location. Not so with dualband or triband antennas, the power feeding coil is pre-set at the factory. If the SWR is elevated, adjust the antenna location until you find the the best SWR. Keep in mind the SBB-224 and SBB-224NMO are a 1/4 wave on the 2M band. A 1/4 wave is only half an antenna, the other half is the ground plane underneath it. 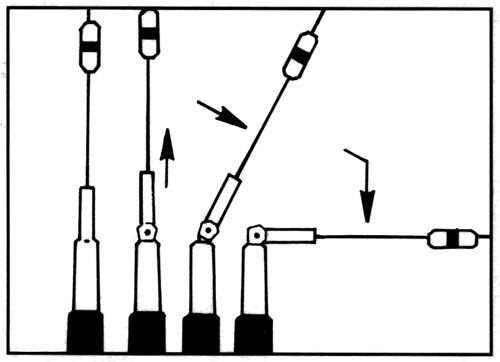 Installing a 1/4 wave on 10 different vehicles will create 10 different SWR results.